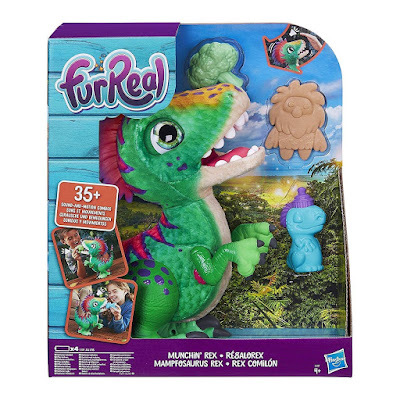 Right now you can get this furReal Munchin' Rex for ONLY $38.77 (Retail $49.99)! This adorable, funny baby dino has quite an appetite, but that doesn't mean he's not a picky eater. He's happy to slurp on his bottle, but his treats? He'll either chomp on them or try to spit them out. Could be this lil' dino needs to learn some table manners! Pet this poseable prehistoric baby on his head and he'll respond with more than 35 sound-and-motion combinations – along with awesome dino-habitat sounds. Wave at him and he'll roar and bounce. The Munchin' Rex pet's a handful, all right – unpredictable, huggable, and oh-so-loveable! To activate full range of features, move OFF-DEMO-ON switch to ON position, then press down on the tip of pet's tongue.